JVP An Accessory to the Spread of Antisemitism in U.S. Normally I spend my time defending the Jewish state and its supporters from false accusations, but today I am leveling a charge at a Jewish organization. 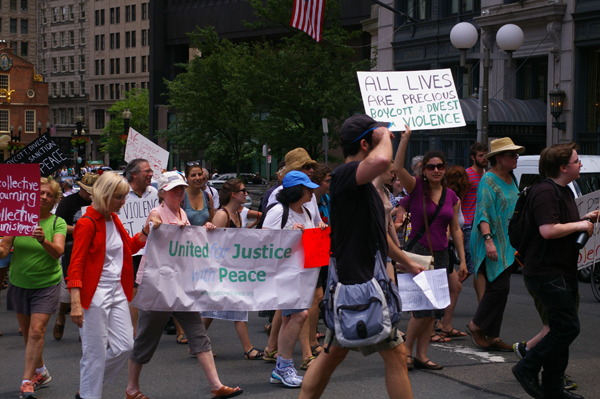 My charge is this: Jewish Voice for Peace helps promote antisemitism in the United States. JVP does this by giving cover to a coalition of anti-Zionists and antisemites, who, if left unchecked, will turn the public square in the U.S. into a battleground where violence against Jews and their supporters is commonplace, as it is in Europe. Take a look. Jews are fleeing France in droves, just as they have been fleeing Malmo, Sweden for years. They have good reason to flee. 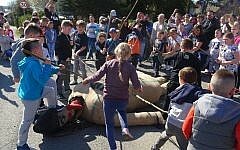 This past weekend, a group of “pro-Palestinian” protesters attacked synagogues in Paris where hundreds of Jews were praying on behalf of three Israeli teens who were kidnapped and murdered in May. And in Germany, a group of Jihadists recently commandeered a police megaphone to broadcast Jew-hatred in the streets. We are seeing nascent signs of similar hostility in the U.S. Last weekend, four men attacked a group of pro-Israel protesters on the streets of Los Angeles. If the hate spreads, America could be afflicted with more acts of violence similar to what we’ve seen in Europe. And ironically enough, a Jewish peace organization will be partially – but not solely – responsible for this turn of events. I’m reluctant to level this accusation, because some people will use my arguments to blame “those damned Jews” for every problem in American civil society, which clearly has seen better days. But the fact remains; JVP is helping to clear the path for some very destructive forces in American civil society. To be sure, it has a lot of non-Jewish accomplices in the so-called peace and human rights movement. These accomplices include the Presbyterian Church (USA) and its Israel Palestine Mission Network, for example. These and other groups all deserve condemnation, but JVP deserves particularly close scrutiny because it provides Jewish cover to the misdeeds of these other groups. Since its founding in 1996, JVP has promoted the idea (embraced by many anti-Zionists) that Israel is somehow in control of the violence and hostility directed at it. JVP’s story is that if Israel (and its Jewish supporters) could only reform themselves and talk with their adversaries, fascist organizations like Hamas and Hezbollah would lay down their weapons and let Israel and Jews live in peace. To that end, JVP has encouraged direct talks with Hamas. 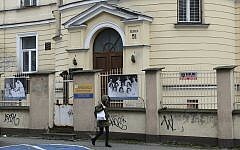 If they were alive in the 1930s, JVP’s supporters and allies would argue that if only Herschel Grynszpan hadn’t killed that German diplomat on Nov. 6, 1938, Kristallnacht would never have happened and that maybe the Holocaust could have been averted through rational discussion and good-faith negotiations – which were made impossible by an act of Jewish violence. For JVP’s Jewish members and allies, it is not antisemitic violence that is decisive, but the Jewish response to this violence that is the determining factor that must be confronted and denounced. Many non-Jews, especially those who support Israel, have a tough time understanding how any self-respecting Jew could embrace such a worldview. What these people do not understand is the exhaustion that afflicts many Jews. Non-Jews can phase in an out of their support for Israel (and the Jewish people) as circumstances require, but for the most part, Jews cannot stop being Jews. Werfel had renounced Judaism. He explored Christian theology in The Forty Days of Musa Dagh and promoted a Catholic worldview in his book about Lourdes, The Song of Bernadette but he was still wounded by such Jew-baiting, from his wife no less, because on one level, he was still a Jew. The upshot is this. For many Jews, being in a world where Jew-hatred is so prevalent and ultimately, inescapable, can be exhausting. Sometimes Jews respond to this exhaustion by embracing the fantasy of Jewish self-reform leading to peace. It is this exhaustion that drives Jews into groups like JVP. It’s a phenomenon described by Kenneth Levin, a historian and psychiatrist, in The Oslo Syndrome: Delusions of a People Under Siege. Some Jews embrace the JVP narrative because it appears to give them control over something over which they really cannot change – the implacable antisemitism that has motivated hostility toward the Jewish people for centuries. Because most Jews do not buy into this fantasy, JVP’s influence is marginal amongst American Jewry, but anti-Zionists simply love the organization because it gives them cover. This is what happened at the Presbyterian Church (USA)’s General Assembly that took place in Detroit in June. The assembly approved a divestment overture that called on the denomination to sell its stock in three companies because they make products used by the Israeli defense establishment. Prior to the vote, commissioners were lobbied by scores of JVP members who traveled to Detroit to attend the assembly. They provided cover to the messaging offered by the Israel Palestine Mission Network of the Presbyterian Church (USA) which promoted divestment through the publication of Zionism Unsettled, a 72-page booklet that demonizes Israel and American Jews. 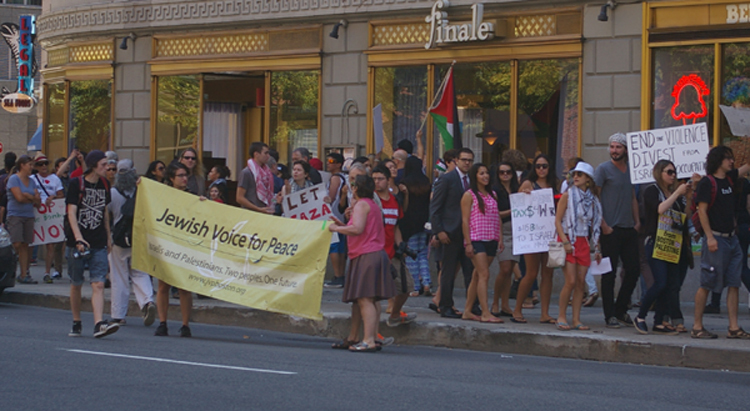 In sum, anti-Israel activists within the denomination within the PCUSA brought the hate, and JVP brought the cover. The General Assembly fell for the argument, but JVP could not protect the PCUSA from the shame of having the divestment vote cheered by former Klansman and Neo-Nazi David Duke and by James M. Wall, a columnist and editor for the anti-Semitic website, Veterans News Now. 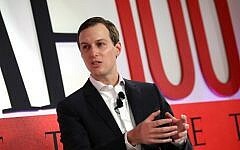 After the vote took place, Heath Rada, the newly-elected moderator of the PC(USA)’s General Assembly, told CNN that “many” of the Jews he had spoken with supported divestment. He was talking about the activists from JVP. 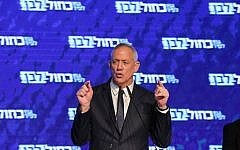 A few weeks later, after a huge amount of criticism from Jews and non-Jews, Rada himself publicly questioned that the denomination he helps lead made the right choice. As well he should. Islamists are turning huge sections of Syria and Iraq into killing fields. People are getting their heads cut off by killers who assert that they were working on behalf of a compassionate and merciful god. Civilization is simply falling apart in areas under the control of Islamists and as a result, thousands of people have become refugees. And who did the PC(USA) single out for condemnation at its most recent General Assembly? Israel. The impact of JVP’s activism has also been on display elsewhere in the United States. Last week the organization helped organize pro-divestment rallies. One rally took place on Wednesday July 9, 2014. This JVP-organized protest was a march that began on Boston Common and then made its way to the department store, Macy’s, which offends people by selling products made by Soda Stream, which has a factory in the West Bank. The marchers then protested outside the offices of two other companies – Veolia and TIAA-CREFF – that have been the target of anti-Israel divestment activists. 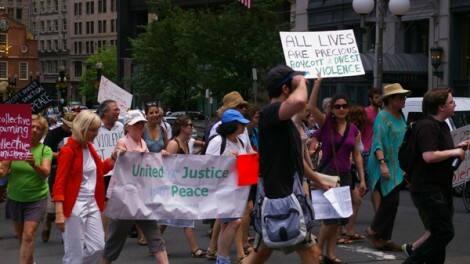 The ostensible goal of the march was to “end the violence,” but in actual fact, the protesters took every opportunity to demonize Israel and condone or legitimize Palestinian violence against the Jewish state. They carried signs that included slogans such as “Demolition of Homes ≠ Justice,” “Bombing Gaza ≠ Justice,” and “End the Violence, Divest from Israeli Occupation.” Not one sign mentioned Hamas and its violent actions. This is not “ending the violence.” This is siding with fascists against their usual target: The Jews. The chants at the march were of the same vein. Passersby heard such old favorites as “Hey Israel, whaddya say, how many kids did you kill today?” “Gaza must have food and water, Israel, Israel stop the slaughter” and the obligatory, “From the river to the sea, Palestine will be free,” a chant which implicitly calls for the destruction of Israel. 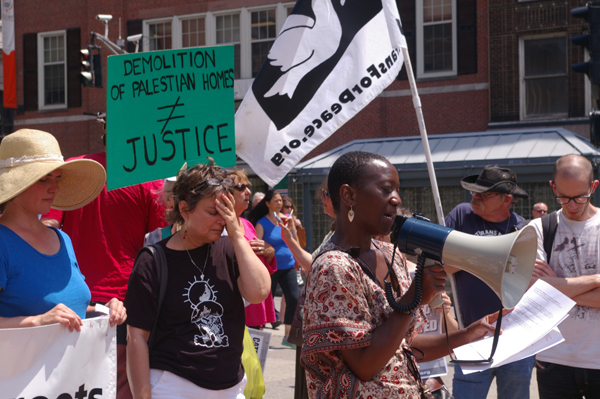 Karlene Griffiths, a local activist who recently returned from the West Bank, led the crowd, which numbered about 120 in a memorial for the dead. A press release distributed by the Jewish Voice for Peace describes her as a “pastor in formation in the United Church of Christ.” She’s also a vocal feminist. While the names of the three Israelis who were kidnapped and murdered in May were read aloud during the memorial along with names of Palestinians killed in the past few weeks, Griffiths’ talk directed peoples’ sympathy solely toward the Palestinians and judgment solely toward Israel. She continued: “Our Palestinian sisters and brothers disproportionately suffer hatred, daily home demolitions, checkpoints, arrests, indefinite detentions and countless micro-aggressions that erode humanity.” The Israelis who have been hiding in bomb shelters throughout the country were left unmentioned. With her proclamation that her help comes from God who loves all humanity, Griffiths is taking a shot at the Jewish self-understanding of the Jews as the Chosen People. Her point is that God loves everybody equally. But she can’t bring herself to accept that Israeli Jews have the same rights as everybody else – to defend themselves from attack against people who want to kill them. “We weep for all the deaths that have been justified by turning the love of self, and of God and of country into fanatical arrogance,” she says. “We lift up the embers of our pain, Oh great God of peace for the way sin which humanity utilizes violence to pursue power, capital land and racial purity. We offer the stones of our fear and anger and we offer our healing for ways we allow national religion and ethnic boundaries to circumscribe our empathy.” While this critique could be used to highlight Arab and Muslim sins, don’t kid yourself. 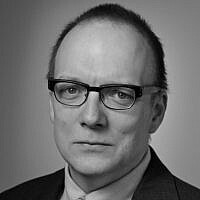 Griffiths offered not one word of criticism toward Hamas. That’s how it is with these folks. They are so offended by the notion that the Jews are the Chosen People that they turn a blind eye toward groups that would murder them. They veer from chosenness to anti-chosenness. As the rally moved through the streets of Boston, I had the chance to speak with a few of the protesters. I asked one woman in her mid-60s how she got involved in the BDS movement. She said that she first realized something was wrong when she saw images of the Egyptian Air Force destroyed on the ground in 1967. “So you think that it wasn’t a war because the Israelis were able to destroy the [Egyptian] Air Force first?” I asked. “Put it this way: I was 19 or 20. I looked at the pictures. I said whatever I’m reading in the newspaper, does not reflect what I’m seeing with my eyes,” she said. The woman, who was affiliated with the group United For Peace With Justice, simply had no idea what she was talking about. No one with any knowledge of the Six Day War thinks that Egypt attacked Israel first, as the woman suggested they do. People know full well that Israel conducted a pre-emptive strike against Egypt’s air force to prevent an impending attack. 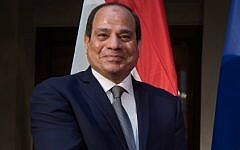 It’s common knowledge that Israel attacked Egypt after Arab leaders, including Egyptian President Gadbel Nasser were promised to destroy Israel (Our basic objective will be the destruction of Israel,” he said. He also closed the Straits of Tiran, evicted UN peacekeepers from the Sinai and massed troops in the peninsula. It’s also common knowledge that prior to Israel’s preemptive strike on Egypt, there was a substantial increase in Arab terror attacks against Israel. And her statement about seeing the Jordanian Air Force was equally absurd. Israel attacked (and destroyed) the Jordanian Air Force after it attacked civilian towns and air bases in central Israel during the Six Day War. Once the planes returned to Jordan for refueling, the Israeli Air Force destroyed them on the ground. The woman’s ignorance aside, her real problem was that Israel won and won decisively. For her this was proof of a conspiracy. Later on, as the group marched from Veolia’s offices to protest in front of TIAA-CREFF, I spoke again with the women from United for Peace With Justice. I remarked that the protest was taking place while huge numbers of Israelis were hiding in bomb shelters. In fact, Gaza does have bomb shelters. They just protect bombs, not people. 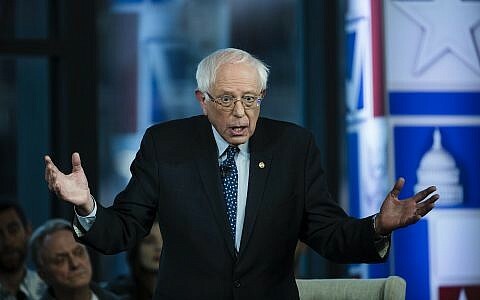 “Do you think Israel would attack Hamas if Hamas didn’t launch rockets?” I asked. “OK, why is it irrelevant?” I asked. These people are not united in a desire for peace and justice. They are united in anger over the fact that Israel has the power to defeat its enemies decisively and protect its citizens. They hold Israel to a utopian standard of conduct while giving Hamas a free pass. George Orwell would call these people objectively pro-Hamas. One protester allegedly assaulted CAMERA intern and pro-Israel activist Chloe Valdary. Prior to the alleged assault (which was caught on video), the woman stated that Muslims and Christians would eventually take possession of Jerusalem and that Jews would “go to hell, inshallah [God willing].” The fact that Valdary is a non-Jew does not negate the fact that she was a target of antisemitic violence at a rally organized by a Jewish peace organization. 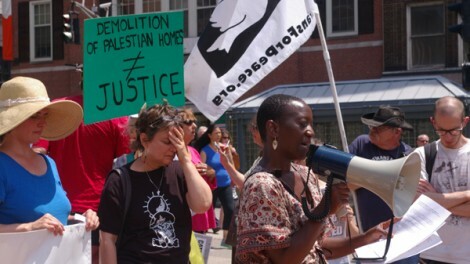 JVP’s Boston chapter has criticized the assault, but one simply cannot support the demonization of Israel – as JVP has – without expecting to see increased acts of violence against its Jewish and non-Jewish supporters. JVP is escorting chaos through the front door into American civil society. Those of us who love America and Israel will have to bar the door as best we can.